As part of my ongoing project into subtleties I undertook the subtleties for MidWinter 2016 held in Rowany. As our new king and queen are Vikings, I wanted the subtleties to be a) Viking themed and b) to tell a story over the course of dinner. Since a subtlety was required before each course, that was four subtleties in total which meant that each part of the story could have a subtlety. Vikings arrive on Viking ships, everyone knows that. I made the sail from some red and white stripped fabric I had lying around and used floral wire to get the billowing shape. The mast was three thick wooden BBQ skewers lashed togther. These were then sewn to the mast, with the pointy bits of the skewer being the bits going into the pie. I thought I might have to use “ropes” to hold the mast in place but the weight of the skewers and the 5mm pastry was enough to keep it in place. It looked really good once the mast was in. Unfortunately, I did not think to take a photo of that bit. Oh well. For the battle, I made a Hnefatafl set. Traditionally in Hnefatafl, a king and his small bodyguard must escape a surrounding army. In our Midwinter version, the monks would have to escape the vikings. Making a whole board out of fondant would be too heavy, so I made a wood game board, in one of my first wood working projects. For ease, I got a dressed pine board that was roughly half the width I would need and added hinges to it. This helped make it a bit more portable as well. It turns out brass hinges and screws are so soft. I messed up one of the screws and had to hammer it over… Still, you can’t see them when the board is in use. I used a dremel and a dremel router guide to make the lines (marking it up in pencil first). There was some slippage but overall, fairly straight lines. I messed up a bit here, because I assumed I could paint into the lines and wipe off the surface paint for a nice in-fill. I should have waxed the board first though, then dremel and paint because the paint stains the raw pine and does not wipe off. Oh well. I painted the whole square in it’s colour and then planed it back with the plane. Turned out fairly well. 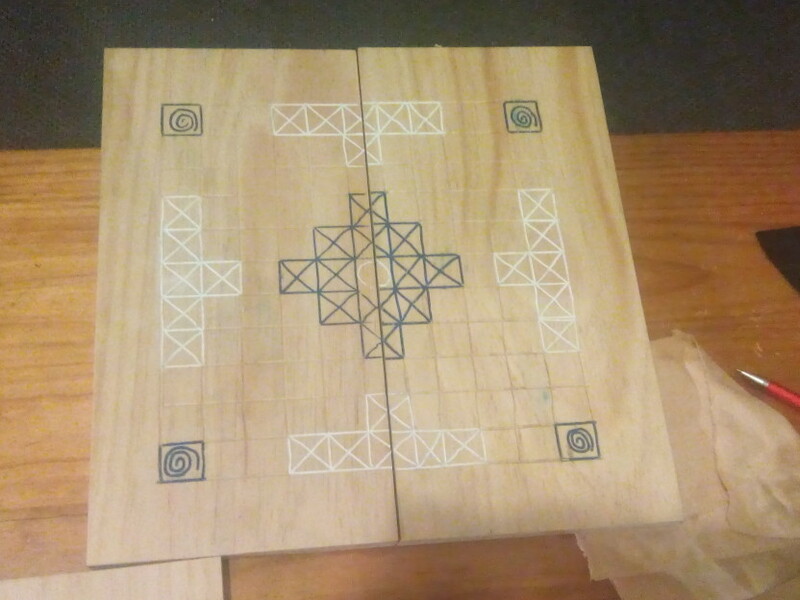 I painted the squares solid and then planed the board back so that only the lines remained painted. The white marks the spaces where the Vikings start, while the blue marks the monks starting position. The white circle in the very middle marks the Abbot’s starting position. Then I waxed it to seal the surface with an olive oil and beeswax paste. If I make another game board, I will use a chip knife to create the lines as I should have better control over that. To make the little men for the game, I took fondant, added red colouring to the vikings and blue for the monks and pinched little men off to fit on the board. I was inspired by the slightly blobby glass and ceramic game pieces found at Birka and Hedeby. The Abbot (King) I twisted two bits of fondant of each colour together and made the head a little ‘V’ shape to represent a bishop hat. If the Vikings win, they have captured the Abbot and they go on to burn down the Monastery (Subtlety 3). If the Vikings fail to capture the Abbot, they follow him back to the monastery and burn it down. Either way, the monastery would be on fire. This was one of the trickier subtleties for me. I based the monastery on St Laurence at Bradford on Avon, which is the oldest surviving original Saxon monastery with no added bits from medieval or Victorian times. Then I rolled out several lots of fondant, with tylose to harden the pastry quickly. Phillipa then assembled it for me (Messed up the measurements a bit despite making a paper copy to start) with royal icing as the mordant. The last subtlety was the toast to the victory. It was actually two subtleties, one being a bowl and the other a horn both made from fondant. The bowl was easy, since that was just working fondant around the inside of the bowl with tylose and that hardened into a good bowl. The horn was harder. I used a funnel to keep the mouth open and made a holder for the horn out of fondant for it to rest on. Phillipa made mead jelly and this was placed inside the horn and bowl for the victory toast. The horn collapsed in the humidity before it could be presented, so I would not make that again without making a wire frame of some kind for it to cling to until the last second.